Block bights are still a favourite trend of mine and i fell in love with the Versace for H&M collection which came out recently, but of course i couldn't justify the price of it all. So I'm really pleased to see the high street give it's take on the collection and Motel are no exception! 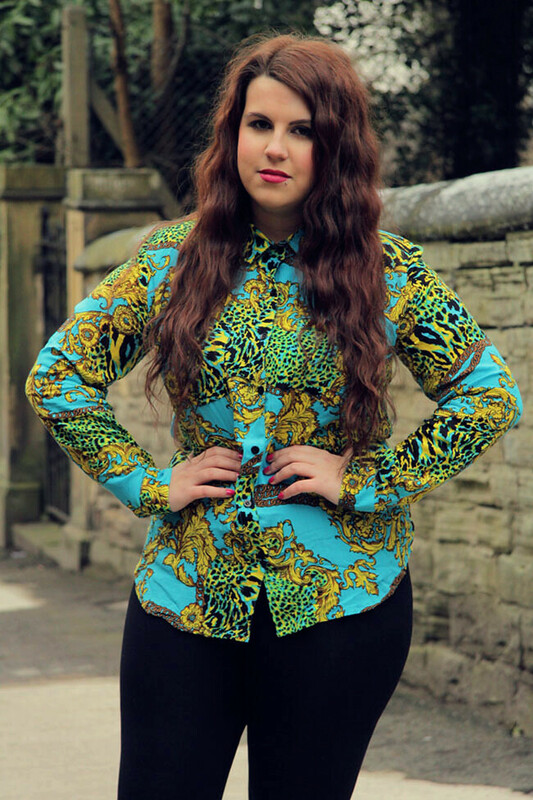 Such an over the top clashing print and i absolutely love it! I'm very happy to finally be on the flatform bandwagon with these ASOS beauties! I would totally recommend them, but i will say the sizing is a little strange and I've heard they've come up really big for some people. I've slipped some insoles in and it's fine for me though! I had a really lovely weekend back home, i always feel so sad when Monday morning comes round and i have to leave. We stayed in all weekend and enjoyed home cooked food, countless games on the WII and sharing lots of stories! It was just really lovely and I'm already planning on my next weekend home! But coming back to Leeds to a lovely little note and present from Matt made me smile a lot! How amazing is that ring? He designed it himself and got it made in America. Nothing quite like some self promotion! I'm going to be spending the week HOPEFULLY putting half of my wardrobe on eBay, tidying up the bombsite that is the bedroom (sorry Matt) trying out some new make up & looks and hopefully celebrating some good news i hope to be getting tomorrow! Hope you all have a fab week whatever you're up to! Oh and just a heads up to those thinking about buying an eyeshadow palette, Blush Professional have the 78 colour & blush palette on at £7.64! But quick, there's only 4 hours left! I'm dying to try some flatforms and I think these black ones may be the ones I go for! Hopefully they won't fit too weirdly! Love the outfit and ignore the weight haters cos you look fab and they need to get out from behind the computer and get a life! I thought that shirt was versace for H & M! So excited to see its motel! You look amazing, I don't understand the weight hate at all. Those who give you hate clearly are so unhappy with themselves they take it out on other people. Glad you're rising above it. This shirt is amazing, I almost prefer it to the shirts I saw in H&M. Love the shirt and the shoes! Your so pretty! You remind me of Khloe Kardashian so much!! Big fan! 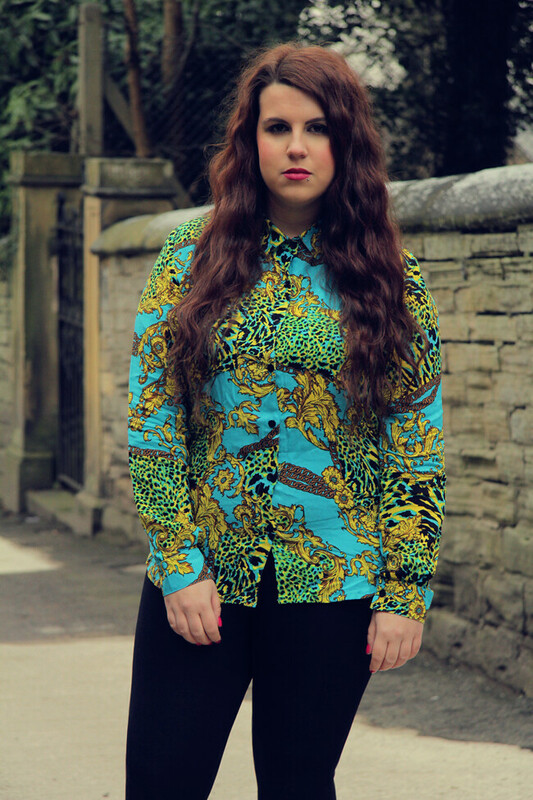 Gorgeous shirt and shoes and your hair looks so brill too! I came across your blog on Twitter and decided to check it out and I love the design and layout. You look amazing and I love your shoes. your look here is simply stunning an I have serious hair envy ! so silly that you get 'weight hate' wear what you love, you always look fab :) Really like those shoes, I think they would be a comfy way for me to add some height in work. My wedges are all a bit too high. You look lovelyy! Adore your shirt! Funky blouse and wonderful shoes! You should not get hate at all! That shirts look amazing on you! Hottie! I need some flatforms in my life and what a cute present from Matt aww. Stunning outfit! Good for you for ignoring the haters, you are far better than all of that! You look so beautiful! It's ridiculous that you get negative comments - you're an absolutely stunning girl and what's more, you're a lovely one too which is something they obviously will never be. I love that you don't let them bring you down because they simply aren't worth it and frankly, if they can't see how beautiful you are, they're not only mean but absolute idiots! Love the shirt. FACT. Very versace inspired. P.s. would rather love the ring! I WANT ONE!